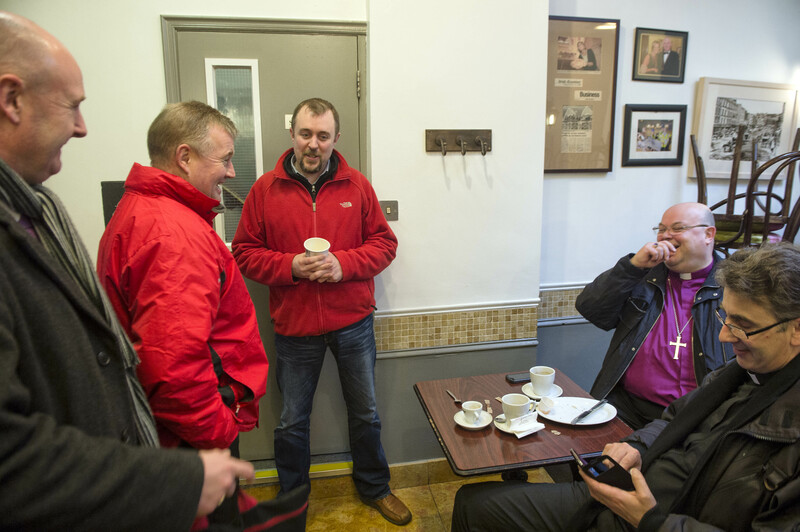 It wasn’t just a cup of coffee that was the draw for the Bishop of Cork (Dr Paul Colton), the Dean of Cork (the Very Reverend Nigel Dunne), and a selection of journalists and a photographer to a favoured regular haunt (Nash19, Princes Street, Cork) re-opening the morning after the tidal floods during the Bishop’s pastoral visit to Cork city centre on Wednesday, 5th February. It was twitter, and the Cork spirit of friendship and cooperation! This entry was posted in Bishop, Church in Society, Church of Ireland, Community Involvement, Cork, Diocese. Bookmark the permalink.